We have left a most extraordinary drilling site. After exploring the distant world of Hothouse climates in our previous site, we have leaped forward in time to just a brief geologic instant before today, no older than 10,000 years ago. It is during this time that the end of the last ice age occurred and the beginning of the warmer interglacial period that we as humans have enjoyed during our entire civilization. The large massive ice sheets that covered all of Canada and the upper part of what is now the US was in full rapid retreat and was soon to be gone within a few thousand years. Meanwhile, deep in one of the deep troughs on the shelf of Wilkes Land that was carved out by the Antarctic ice sheet during the glacial maximum 20,000 years ago, sediments were being deposited and preserved as the strong currents would not able to reach down into this chasm on the bottom of the ocean. Above it, near the sea surface, microscopic one celled organisms that make their own food like plants, were blooming during the sea ice free conditions brought on by the short austral summer and then settling like rain down into this trough. 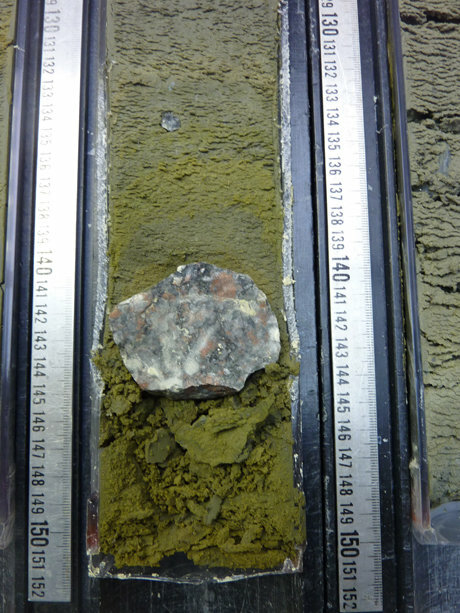 They indeed had been blooming at a furious rate, for as when we recovered the cores, we saw banding that suggested that the sediments were accumulating at almost an inch per year. This banding is probably due to the annual changes between winter and summer. We ended up with almost 100’s meters of core that spans probably back to the end of the last ice age. This is a most incredible discovery, as it is literally like a tree ring record from the deep ocean. Unlike tree rings though, a multitude of measurements will be made to decipher the secrets of Antarctic climate change at a near annual resolution for the last 10,000 years. A large team of scientists will work on the core taking every kind of measurement possible to decipher the climate secrets it holds. I will be working with Rob Dunbar and others to develop an ultra high-resolution (5 yr resolution) isotopic record using shells of the planktonic foraminiferal species Neogloboquadrina pachyderma. This species is only found in polar oceans both in the northern and southern hemispheres. P.s. An incredible two mornings. Besides all of the amazing science that is going on, we have had just the most incredible weather, with clear crisp blue skies and crystal visibility so we can gaze out and the wondrous view of the Antarctic continent. As we are also on the midnight to noon shift, we also were able to watch the sunrises, of which each one was more spectacular than the first. In my next blog, I will put up some pics to share with you what I saw.